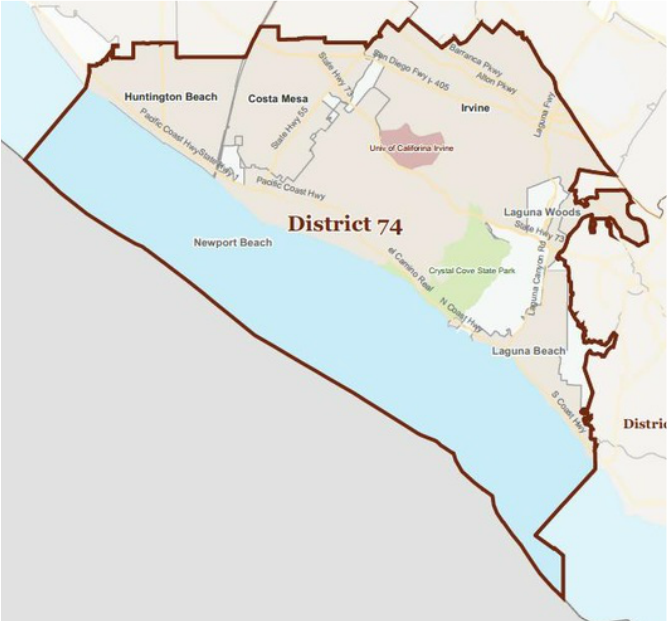 Republican Matthew Harper currently represents Assembly District 74 and will not be termed out until 2026. Harper is expected to easily win re-election in 2016. Huntington Beach Mayor Matthew Harper has always been passionate about developing public service excellence by building consensus for community vision with all stakeholders. Before joining the Huntington Beach City Council, Mayor Matthew Harper was elected to the Huntington Beach Union High School District (HBUHSD) Board of Trustees in 1998, there completing three full terms through 2010. Mayor Harper also serves on the Orange County Transportation Authority (OCTA) Board of Directors and additionally as a representative to the Southern California Association of Governments (SCAG) Regional Council. Matthew Harper’s priorities as Mayor include public safety, infrastructure, economic development, administrative & fiscal accountability, property rights and personal freedom. A graduate of Huntington Beach High School, Matthew Harper is a member of the HBHS Alumni Association. After transferring from Orange Coast College in Costa Mesa, Harper earned his Bachelor of Science degree in Public Policy and Management at the University of Southern California. Matthew Harper is a long-term member of the Orange County Republican Party Central Committee and has served in many Republican leadership roles for over 20 years, including two years as state chairman for the Young Republican Federation of California.